Pastry adapted from Mastering the Fundamentals of French Pastry by Christophe Felder. Filling adapted from Butter Baking. For the filling, mix the sugar, cornflour and salt in a small bowl. In a large heatproof bowl, whisk the egg yolks, then whisk in the flour mixture one tablespoon at a time. Split the vanilla bean lengthways and scrape out the seeds. Put this, including the vanilla pod into a medium saucepan with the milk. Place over high heat on the stove and heat until little bubbles start to appear around the edges. This is called scalding the milk. Pour the milk into the egg mixture, whisking continuously until combined. Pour the mixture back into the saucepan and cook over a medium heat. Continuously whisk the mixture until it becomes thick and begins to bubble. Then whisk vigorously for 10 seconds and remove from the heat. Strain the mixture through a sieve into a heatproof bowl, discarding the vanilla pod. Cover right onto the whole surface of the pastry cream with plastic wrap (this prevents a skin forming) and refrigerate until cold. This will take about 4 hours. For the pastry, place the flour, sugar and butter in a food processor and process until the mixture resembles fine breadcrumbs. Add the eggs yolks and water and pulse in the processor until the mixture starts to come together. Turn the pastry out onto the bench, form into a disc, cover in plastic wrap and place in the refrigerator for one hour. Pre heat the oven to 180°C. Remove the pastry from the fridge and roll out between 2 sheets of baking paper to a 3-4mm thickness. Grease 9 mini tarts pans (mine were 10cm in diameter however just use the size you have), and press cut outs of the pastry into the tart pans, trimming away any excess. Re-roll out excess pastry for more tart shells. Prick the base of the tart shells many times all over with a fork. Bake in the oven for 15 minutes or until golden brown. Remove from oven and after 5 minutes, turn the tart cases out of the pans and cool on a wire rack. Whip the cream in a standing mixer with the whisk attachment or with hand-held electric mixer until stiff peaks form. Stir the pastry cream to soften then fold through the whipped cream. Using a piping bag fitted with a round size 13 nozzle, pipe dots into the tart cases to fill. 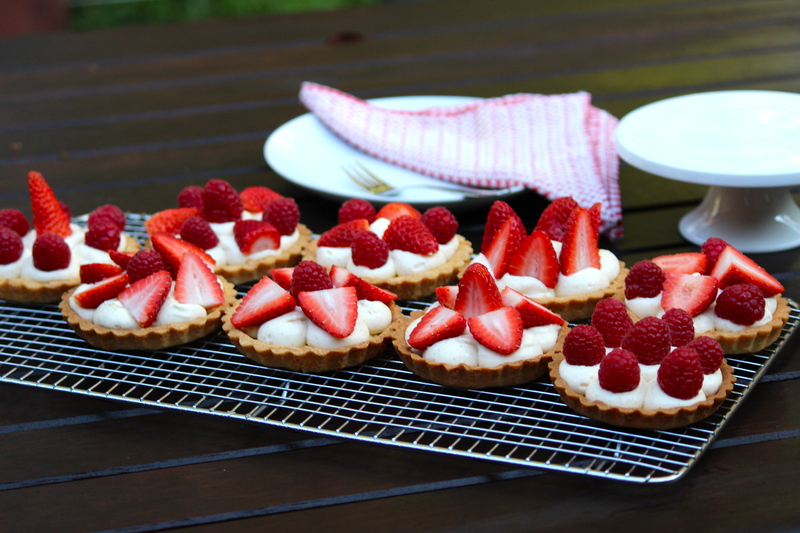 Top the tarts with chosen berries and keep in the fridge until served.